We had a great time running the Bad Monkey Open over the years. There were many good memories and a few WTF memories too. We have decided to get out while the getting is good and throw in the towel for the Bad Monkey Open. We appreciate all our loyal players and are proud to call many of you our friends. Hopefully, we'll see some of you on the great courses in the Pacific Northwest. Steve can most often be found at Lucky Mud now. If you ever come out this way, send me a text, I need the excuse to get out of my office and play. Ryan spends most of his free time recently climbing things so if you ever need a guide to get to the top of something shoot him a message. The 2017 Bad Monkey disc golf tournament is scheduled for July 8th and 9th at Leverich Park. This year marks the 9th time we have gotten together to throw discs, enjoy a great day in the park, tell stories and complain about our missed putts. We are working to round up some great sponsors and put together a great player's pack and extras at the tournament. We are planning once again to provide 3 rounds of challenging golf on the course, coffee and snacks throughout the day, a player's party Saturday evening, lunch on Sunday and of course a great awards ceremony and raffle. Mark your calendars for April 24th at 7pm when registration will open up on 4DiscGolf.com. PDGA B-Tier tournament. 99 spots for players. Firefly Disc Golf is proud to announce that Latte Da and Next Adventure have stepped up to help out with sponsorship of this years Bad Monkey Tournament! The field is set for this year's Bad Monkey tournament. The weather looks promising and we've got just about everything ready for the tournament. Attached you will find the player's guide in pdf format. We will have printed copies for you at sign in. Please note the schedule and which pool you are playing in. Pool B which consists of Intermediate divisions, recreational and juniors will have the first round morning and afternoon on Saturday and the second round on Sunday. The Advanced divisions will have the second rounds on Saturday and the early round on Sunday. New this year, Firefly Disc Golf is hosting a player's party (all players, guests of players and Firefly Disc Golf are welcome) Saturday evening at Latte Da. Latte Da is located just west of main street on 39th street. Players will get a drink coupon in their player's pack that is good during the player's party and Latte Da has wine, beer on tap, food as well as coffee and soft drinks available. Firefly DG will be running several contests and giving away a bunch of prizes including disc golf bags, hats, umbrellas, discs and a variety of other prizes. Please plan on joining us at 6pm and invite your friends. Next Adventure's sponsorship will provide a generous Ace Pot and several gift certificate prizes for the Player's Party as well. Get out there and practice your putts...you know you need to! Finally, Mark Hedden, who is a regular volunteer keeping Leverich looking awesome, is trying to put the finishing touches on the course this week. He plans to be out there each night this week spreading bark chips and doing other clean up. Hopefully some of you can get out there and give him a hand. He'll be in the upper parking lot by 5pm each night with his white pickup and coordinate what needs to be done. If you can bring a shovel and/or a rake that would be helpful. Please consider giving him a hand if you are available. Firefly Disc Golf Promotions LLC is proud to present the artwork for the 2016 Bad Monkey Disc Golf Tournament. This logo will be included on the discs and hoodie provided in the player's pack for all players. A limited number of extra discs and hoodies will be available at the tournament for guests and players that want more than one. This will once again be a PDGA sanctioned 'B' Tier tournament at Leverich Park in Vancouver, Washington. The event will run with two flights of Amateur ONLY players totalling 100. Each player will play 2 rounds on Saturday and one round on Sunday. Bad Monkey Bikes closed their doors last year, but we just can't say no to this great tournament. Because they won't be sponsoring the event we will be running a trophy ONLY event this year. We will use player fees to provide a player's pack and lunch on Sunday, but we will NOT be giving out scrip to any players. Trophies will go to the top finisher in each division and the top 3 places in each division with more than 12 players. 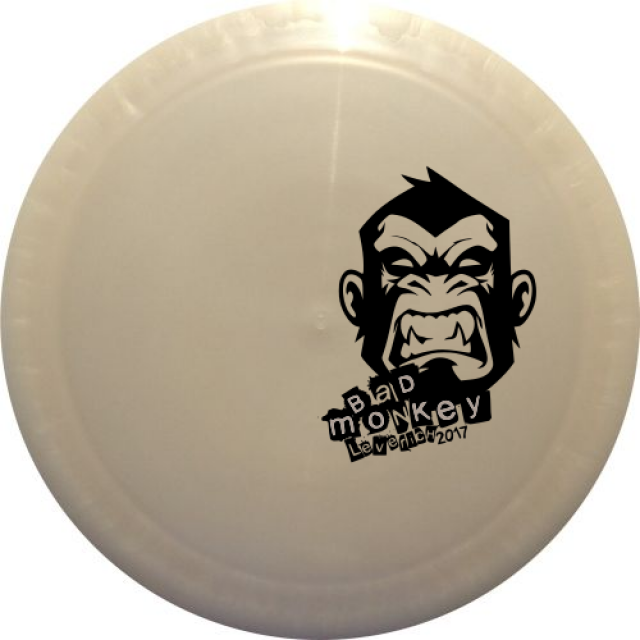 We are still finalizing the player's pack but your entry fee will not only allow you to play three rounds on the exclusive Bad Monkey layout at Leverich Park, but will include lunch on Sunday, at least one disc, a hoodie, mini, and more. Any proceeds from this year's event will go to the Park Foundation of Clark County which is helping us raise funds for the next disc golf course in Clark County. We have been actively working through the permitting process on a couple of possible sites including Frenchman's bar and a couple of courses yet to be made public. Don't forget to bring your lawn chair. One of the favorite activities of this event is hanging out between rounds and watching the other pool throw, with a cool (non-alcoholic) beverage in your hand and catching up with other players. New for 2016 we will be hosting a player's party at Latte Da on 39th Street Saturday evening from 6pm to 8pm. We plan to have a putting competition and a trivia challenge along with drinks and just hanging out. We have prizes to give away and Latte Da is an awesome place to hang out with a great selection of beer, wine, coffee and much more. Plans are underway for the 2015 Bad Monkey Open. This will once again be a PDGA sanctioned 'B' Tier tournament at Leverich Park in Vancouver, Washington. The event will run with two flights of Amateur ONLY players totalling 100 on Saturday and Sunday, June 27-28, 2015. Bad Monkey Bikes on Broadway is (of course) our title sponsor and promises to sweeten the pot with awesome swag and increasing the scrip payout by 30%. Lunch will be provided for all players. Registration is open now on 4DiscGolf.com. Registration for the 2014 Bad Monkey Open starts on May 1st at 6pm on 4DiscGolf.com. The tournament will be held June 28-29, 2014 with two pools of players participating each in two rounds of golf on Saturday and one round on Sunday. Sunday afternoon Bad Monkey Bikes will provide lunch followed by an exhibition match between the top players of the weekend. The fifth annual Bad Monkey Open will be held at Leverich Park, Vancouver, Washington on July 13-14, 2013. This PDGA sanctioned B-Tier Amateur only event continues to be the largest such event in Vancouver.